As hoped (dare one say expected), GPLv3 appears to be getting a warm welcome. Here are a few articles which you might find informative. “The Free Software Foundation listened to people outside its normal support base. The GPL 3 is better than the GPL 2,” said Mark Radcliffe, an intellectual property attorney with DLA Piper’s Silicon Valley office, during the Linux Foundation Summit. Free Software Foundation (FSF) leader Richard Stallman said at the launch of the group’s new version 3 of the General Public License (GPLv3) that businesses are “foolish” not to adopt nonproprietary technologies as he contends that the continued use of paid products limits companies’ innovation and weakens security of their IT operations. For example, he said that Microsoft’s process of removing support for various computing devices and applications in its products forces businesses into a never-ending cycle of “forced upgrades,” a system he said should be made illegal. In another sense, onboard functions like Vista’s remote software upgrade feature allow Microsoft to essentially take control and manipulate end-users’ computers whenever they feel like it. Overall, MontaVista which develops Linux for the embedded market, isn’t worried about the GPL version 3. Now, from China to India, from Venezuela to Brazil, from Tivos to cell phones: Free software is everywhere and it is slowly building a worldwide movement of users demanding that they have control over the computers and electronic devices they own. Update: Good news! The almighty Creative Commons supports GPLv3 as well. It sure is pretty, but look underneath the surface. Let’s start by clarifying that I don’t have anything against Apple. In fact, I used a Mac for over year at work. There is, however, a hidden similarity between some aspects of Windows Vista and the iPhone. Both are attractive to one’s eyes, but there are hidden dangers (and possibly agendas) which are being centralised and then embedded in that very rigid product. Due to simultaneous big announcements, followed by release of the iPhone and GPLv3, some sites are talking about GPL’s effect on the iPhone. Some articles seem very critical, but not rightfully so. Various bits of software on the iPhone, such as KHTML, are GPLLGPL-licensed, but this does not mean that companies will get ‘punished’ immediately, if at all. Some articles embrace and use dramatic licence to make issues seem greater than they truly are. Apple will not be affected. It might, however, need to honour the code that it uses. KDE [*libraries* are] is still GPLv2LGPL-licensed [see correction in the comments below]. So, let’s look beyond this. The iPhone does not even have an SDK. Development for the iPhone is restricted to Web browser widgets. The bigger issues are moral ones and are not to be confused with licensing. The press seems to be missing this core point. Last night, the FSF sent out an E-mail calling the iPhone “Defective by Design”. That is the tagline and label consistently used to describe products that make use of DRM and restrict (or altogether eliminate) consumer rights. There are other modern and sophisticated smartphones that neither mimic nor replace the iPhone, but they are truly open and they earned some positive early reviews. Trolltech’s Greenphone and OpenMoko are just two examples, but let’s not get promotional here. The message to take here is that it’s rather ironic that GPLv3 is released at the same time as a product whose deficiencies might be highlighted by the big announcements (not to mention heated discussions that accompany and follow the FSF’s limelight). A few days ago, amid some excellent news for Linux, Richard Stallman reminded us why restrictions are dangerous. You are encouraged to read this if you haven’t. We recently spoke about proprietary and/or patent-encumbered software, including fonts and their rendering. We discussed a particular controversy and later pointed out that proprietary software may be included in out-of-the-box Opensuse. Because there was a lot of unwanted noise over Truetype and Novell at at the time, perhaps it is worth quoting part of a new interview with a Freetype developer. [Q:] If the patent owner of hinting gives the Freetype project a free license, would you accept it? David Turner [of Freetype]: It really depends on the terms of this “free license”. Basically if it means the patent can not be freely re-licensed to other people, I really don’t see why I would find that useful. If you absolutely need the bytecode interpreter, you can be patient and wait for October 9, 2009, when the patents expire. Is anybody else getting the feeling that a patent reform or overhaul is desperately needed? Andy Updegrove has some nasty new details to share with his readers. On the face of it, all the negative speculations are now being confirmed. …it indicates a desire by Microsoft to institutionalize and expand a perpetual, standardized environment that would surround a single vendor’s products. This would inevitably serve, as Microsoft would of course intend, to extend its monopoly position into the indefinite future. The result would be to continue to stifle innovation and competition at the office productivity suite product level as well (consider the flowering of diverse products that have sprung up since ODF gave hope of actual competition to multiple proprietary and open source ISVs). Microsoft has stated before that the submission of OOXML to Ecma did not mean that anyone could clone Office without being sued for infringement – just that it would be easier for people to work with it. No such flowering will ever likely exist around OOXML, given Microsoft’s enormous lead in products based upon that format. Remember some of the most recent developments. Microsoft’s deals with Linux vendors have them support these actions. They have to. There is a contract. Never mind the fact that Microsoft lies and deceives. Never mind that it wants to protect its monopoly from Free software. It is not surprising that Linux users disengage their relationships with Linux companies that joined hands with Microsoft. Update: there is more on this subject here. On the face of it, OOXML was only the beginning. Microsoft’s plan is to control and ‘extend’ replacements for PDF, JPEG, Flash, and probably HTML as we know it. Patents will even allow Microsoft to sue or to tax those that ‘dare’ to implement software supporting those ‘standards’, which are the work of just a single company that never sought consensus. It’s that time of the week again. Indeed, Novell is not evil, so the tone will be changed to give a rare praise. Opensuse developers are apparently working on an attractive graphical front end which enables creation of customised Live CDs. The module is in very early stage of development, but it clearly shows the promise of making system imaging approachable to everyday. It would be nice to see it matching the capabilities of a similar feature that can be found in PCLOS 2007. The next step would be to be able to create system snapshots out of an existing machine – PCLinuxOS supports this with the help of a Debian script afaik. That makes it even easier to distribute specific, dedicated appliances. Red Hat boasts similar features as well. Fedora 7 hits the streets on May 31st. One of the most exciting features of the Fedora 7 release is the fact that users can remix the Fedora code in any variety of ways. Tools are provided that allow the user to build either a customized LiveCD or installable ISO, and to reach out to any 3rd-party RPM repositories and pull in packages from them at compose time. Here is yet another good review of Opensuse. Overall, openSUSE 10.2 is great to use and feels as though it runs faster than any other distribution on my laptop. I would highly recommend using 10.2 for Linux beginners or people looking for a great out-of-the-box operating system, even though it does require minimal accompanying downloads. For advanced users, I think that openSUSE should be given a chance and I think many power users are watching the release of 10.3 very closely. I never seem to hear details about KDE 4 without at least a mention of openSUSE 10.3. Do remember that our anger and frustration are directed at Novell’s management, not the various developers. Some come-and-go (or “hit-and-run” rather) readers apparently fail to see this. Association and affiliation lead to misinterpretation and inference. Nat Friendman announced SUSE Hack Week on Monday. Here is a new video from Prague’s Hack Week. Also at the beginning of the week, a couple of articles on virtualisation were published. Novell’s participation was included in a separate article. Towards the end of the week, Novell unleashed a few press releases that boasted its cross-platform identity management software. By making this type of technology available to Linux and Macintosh users, DigitalMe is helping accelerate the adoption of this user-centric approach. Interoperable, cross-platform Information Cards provide a much needed open identity framework that is both transparent and expedient for web users,” said Dale Olds, distinguished engineer and Bandit Project leader at Novell. “Sxip Access support of DigitalMe is a major step forward in security and ease of use for on-demand applications. SailPoint Technologies today announced the first standards-based integration linking its identity risk management solution with Novell’s identity and security solutions. More ZENworks raves were soon to follow, but all these raves from Novell were possibly overshadowed at this point. Why? Because Red Hat released its encouraging financial figures. This one, for a change, does not come second-handed from Jim Finkle. What do you reckon is going on here? This may be very subtle, but is Red Hat softening? Has last week’s stance changed? Please call me a paranoid. The context of this article is purely financial. As you probably know by now, today is an important day for the GNU General Public Licence. For many years, this extremely popular software licence has neither changed nor evolved. Amendments have since then been made to protect the software from new phenomena and new strategies that exploit loopholes. An upgrade is required, however, in order for these amendments to take effect. Despite an awful lot of noise (Microsoft is behind a lot of it, albeit the company usually recruits proxies and invites its lobbying arms), support for the new licence is fairly strong, based on an independent poll. In addition, the licence has earned the blessing of and won approval that includes big names such as Google and Alan Cox. Eben Moglen confidently said that wide adoption of GPLv3 is expected. According to this Web new site, many projects are already committed to this upgrade. You might be surprised to see the numbers. Bob Sutor gives a nice introduction that explains the great importance of the new licence. FOSS [Free Open Source Software] would die if it were to be rigid, uncompromising, and did not reflect the needs of the community and the end users who are employing the software at an increasing rate. GPL v3 and the process that created it reflect the continued process of rebirth and intellectual progress necessary to sustain growth for FOSS. It is particularly important to stress that Novell and its accomplices are true dangers to the long-term growth of FOSS. These companies only care about their own short-term benefits and expect their suppliers (programmers) to deliver code while they perish and get forced to pay for ‘taxable’ and restricted Free software. Here is a a short video teaser where Eben Moglen explains why GPLv2 loopholes need to be closed. The new licence sometimes involves compromises. Nobody likes change, especially when it’s poorly understood. However, for the prospects of digital freedom, one needs to consider the long-term benefits. Even Sun Microsystems, which once thrived in proprietary legacy, is seriously considering this new licence. The Linux kernel is being pressured to follow suit. Update: it seems as though some core parts of GNU/Linux distributions adopt GPLv3 immediately. On the day of release, a group of more than 15 open source projects will release their software under the new licence, Brett Smith, a licensing compliance engineer with the FSF, told vnunet.com. Update #2: Novell refused to comment on GPLv3 a few days ago, but it has just released a statement. Let us take a moment to discuss issues that are associated with patent-based racketeering. This will not be reiteration of the old same (and tired) story. We are often reminded that the purpose of patents is to spur advancement in science and technology by offering incentives. What happens, however, when these incentives are being collected not through funds, but from peers? What happens when a party earns exclusive rights to do something very basic? 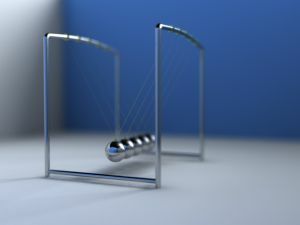 Surely, rather than following the Newtonian path and standing on the shoulders of giants, we just look for other small shoulders to stand on (that’s a Newton’s Cradle in the photo by the way; computer-generated and royalty-free). We do not collaborate; instead, ownership of knowledge (that’s the equivalent of culture) is being gained. From a scientist’s perspective, this may seem absurd, unless of course that scientist puts personal (not collective) benefit at the top of all priorities. Therein lies the conflict between the betterment of humanity and greed. Another perspective worth mentioning here comes from an InfoWorld blog. The writer labels the situation that Microsoft has created a state of intellectual dishonesty. The intellectual property racket must end. Intellectual property laws were designed to promote innovation, not to allow monopolists to stifle it. We have an entire generation that has been taught that new ideas have to be “protectable” to be worthy of consideration. Whatever happened to being faster and better than the competition? Do these companies really need a seventeen year head-start? Does Microsoft really need a government-sanctioned sledge-hammer with which to intimidate smaller companies? It sometimes seems like Microsoft, which once truly engineered and produced some software (acquisitions increasingly replace homebred program), has turned to marketing, then lawyers, and then bullying. To give credit to them, the company saw some days when there was passion for software, not just anything that might produce money. Later on, engineers were replaced by businessmen. This probably happened when Gates and others gave place to some new leadership. That was also when patent applications began to be filed rather than be denounced, as Gates once suggested. Even years ago, Richard Stallman highlighted the sheer hypocrisy and the transformation from science to greed. Look at some think tanks and panels every day and be disgusted by the manipulation of the system. Large businesses are in the business of destroying the smaller businesses. The patent system, rather than encourage diversity in the market, achieves the very opposite thing. It is not surprising, however, as those that write the law (frequently by proxy) are the large companies. A reform is needed or else we will continue to observe a world that combats sanity.